Climate model projections are our best approach to make predictions about future sea ice in both hemispheres for the whole 21st century. Given the large spread between individual model projections and distinct discrepancies between model results and satellite-based observations for the last decades, the question arises how accurate these projections are. The reliability of such simulations depends on how well key processes are captured in the climate model. CMIP5 (Coupled Model Intercomparison Project Phase 5) models generally simulate the observed sea ice decline better than the older CMIP3 models indicating that, for example, the improved representation of sea ice processes is important (Stroeve et al., 2012). 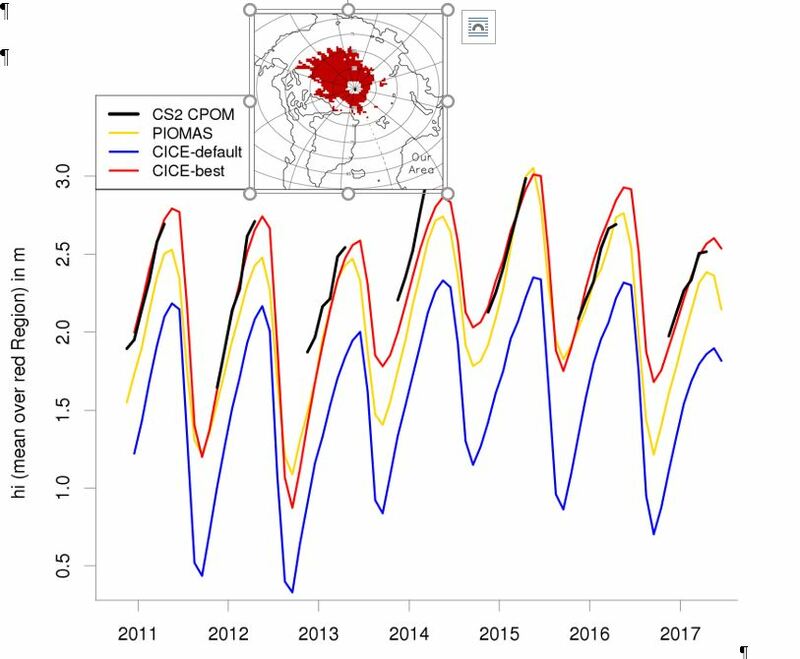 In Danny Feltham’s sea ice group we have added and improved several sea ice processes in the Los Alamos sea ice model CICE which is used in many climate models (e.g. the current U.K. Met Office model HadGEM3). The most important contributions are a physical melt pond model describing the evolution of melt ponds (Flocco et al., 2012; Schroeder et al., 2014), an elastic anisotropic plastic rheology accounting for the subcontinuum anisotropy of the sea ice cover (Tsamados et al., 2013) and a spatially and temporally variable form drag parameterization for the momentum exchange between ice and atmosphere as well as ice and ocean (Tsamados et al., 2014). These new developments increase the realism of the sea ice model. However, incorporating these developments in a climate model does not result in better climate simulations as a matter of course. Many physical and empirical parameters are not very well constrained in a sea ice model requiring a tuning process applying observational data. In the past, most of the tuning has been based on sea ice concentration data derived from passive microwave imagery. This is a problem because realistic sea ice thickness is crucial for simulating variability and trends of the sea ice cover. Using radar altimetry, sea ice thickness estimates are available from CryoSat-2 (CS2) (e.g. from the CPOM portal) during the ice growth seasons since 2010. However, the discrimination of ice and open water, the discrimination of ice type, retracking radar waveforms to obtain height estimates, constructing of sea surface height beneath the ice, and estimating the depth of the snow cover result in a grid cell ice thickness uncertainty of about 25 %. Figure 1: Mean effective sea ice thickness over read region shown in inlet above. Verification of CICE-default and CICE-best with Cryosat CS2 CPOM. Results from the ocean sea-ice model PIOMAS are added for comparison. Red area is defined as region where impact of winter growth on thickness change dominates other factors and where CS2 data are most accurate. In a current study we selected an optimal region for comparing sea ice thickness between simulations with the sea ice model CICE and CS2 data (see red region in Figure 1) by taking into account the strengths and weaknesses of both approaches excluding locations where the number of CS2 observations is limited and the sea ice is thin (Schroeder et al., 2018). Figure 1 shows that a default CICE simulation (blue) strongly underestimates ice thickness, but a new CICE setup (red) agrees well. The most important impact comes from implementing a new process: accounting for the loss of drifting snow. Our optimal model configuration does not only improve the simulated sea ice thickness, but also summer sea ice concentration, melt pond fraction, and length of the melt season. In spite of its uncertainties we successfully applied CS2 sea ice thickness data to improve sea ice model physics. Reducing uncertainty in sea ice projections requires better representation of key processes, not only of the sea ice component, but also in the atmosphere, the ocean and regarding the coupling. Polar cloud formation and the interaction with the sea ice surface has been identified as a key process which is currently not represented satisfactorily. Flocco, D., D. Schroeder, Feltham D. L., Hunke E. C., 2012: Impact of melt ponds on Arctic sea ice simulations from 1990 to 2007. J. Geophys. Res., 117, C09032, https://doi.org/10.1029/2012JC008195. Schroeder, D., Feltham D. L., Flocco D., Tsamados M., 2014: September Arctic sea-ice minimum predicted by spring melt-pond fraction. Nat. Climate Change, 4, 353-357, https://doi.org/10.1038/NCLIMATE2203. Stroeve, J. C., Kattsov V., Barrett A., Serreze M., Pavlova T., Holland M., Meier W. N., 2012: Trends in Arctic sea ice extent from CMIP5, CMIP3 and observations. Geophys. Res. Lett., 39, L16502, https://doi.org/10.1029/2012GL052676.